I am a big believer in simple, no fuss side dishes for holidays. Were all doing the MOST as is. From family entertaining, to cleaning, to avoiding discussions about politics - everything is taking so much out of us! This is why I find it crucial to make food thats simple, delicious and lets the ingredients speak for themselves, ESPECIALLY during the holidays. Just toss in the oven, and forget about them until the timer goes off. 5 minutes to prep… and 25 minutes to do whatever your heart desires! This recipe combines two of our favorite side dishes… glazed carrots and crispy brussel sprouts. The roasted grapes compliment them both super well and will add a lil extra twist to the normal spread. These would also go great on an appetizer board! Preheat your oven to 375. 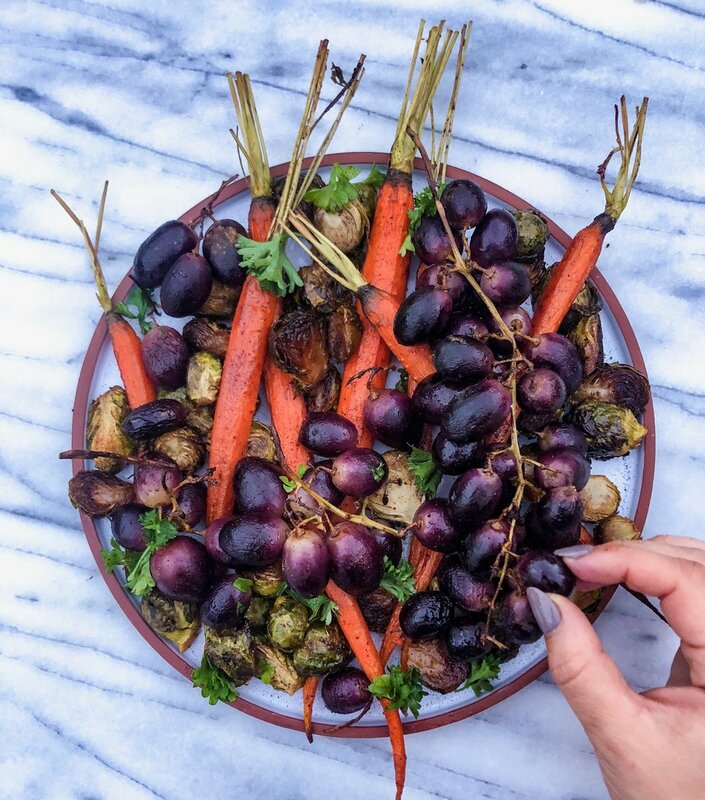 Grab a sheet pan, line it with parchement or a silpat and throw the grapes, carrots and brussel sprouts on top. Toss with everything else! Pop in the oven for about 25 minutes or until carrots are fork tender. And boom, you’ve got the easiest side dish….ever.